Company First Sergeant/Educational Assistant: The First Sergeant is responsible for assisting officers (teachers) with maintaining order in the classroom, instilling discipline in their company, conducting PT classes, and advising cadets on their academics (making sure they are on track to graduate, etc.). The first sergeant ensures good order and discipline within the company, maintains documentation of both favorable and unacceptable conduct of cadets assigned , and ensures the company commander is informed, supported, and mentored in all military matters. The 1st Sergeant assigns students to leadership positions at the initial and intermediate supervisory level. The 1st Sergeant instructs cadets in the US Army dismounted close-order drill and utilizes both eh Army's Physical Readiness Training and the United States Marine Corp's High Intensity Tactical Training fitness testing. 1st Sergeants are accountable for all assigned cadets and reports directly to the Company Commander/Teacher with any issues requiring his or her attention and/or action. The 1st Sergeant is the primary instructor for military science courses in any given field as the resident subject matter expert. The 1st Sergeant ensures all areas assigned to their company are kept clean, neat, and in serviceable condition. In addition to this, the 1st Sergeant reports any facilities maintenance requirement that must be out-sourced to Battalion Sergeant Major. While prior military experience not required, it is considered a plus. College experience is also preferred, but not required. If former military, please include a copy of DD form 214 discharge with application, and either official or unofficial college transcripts as well. Contact either Command Sergeant Major Brainard at (541) 246-1640 or our main office at (541)246-2840 M-F 8:00 AM and 4:00 PM with any questions. You may also email CSM Jim Brainard at jbrainard@wlacademy.org. We are a non-profit charter school for youths that are at a difficult stage in their lives. 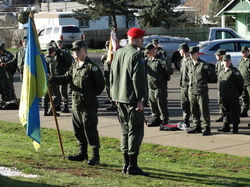 We provide the structure, academics, and caring for our cadets through a military styled program. Both the high level of academic growth and decreased behavioral issues that we achieve act as a testament to our cadets' resolve and are both real and perceptible results that speak for themselves. Currently there are no intern positions available. However, we do have numerous opportunities for Student Teachers who are working towards their teaching licenses. WLA is always looking for volunteers. If you feel you have something to contribute to a good cause please don't wait. You can contact us either by telephone at (541) 246-2840 or email our Program Director at kklontz@wlacademy.org.